It’s all invisible. It’s all related to HOW MUCH allergen is ingested versus a person’s “threshold of tolerance”. This has been tested extensively and explains why “trace” is just a concept and so many allergic people eat “may contains” just fine. There IS an amount of allergen that can be ingested with ZERO reaction–and that’s how OIT/desensitization works. People often ask how we “know” the starting doses will be tolerated. The answer is that they have tested this many times to learn the “threshold of tolerance”. Here’s a study published in 2009 where you can see how the “Day 1” suggested take-home dose of 3 mg of peanut protein was derived. A peanut has 250-300 mg of peanut protein, so 3 mg is about 1% of a peanut. 95% of patients could tolerate as much as 3mg on Day 1. 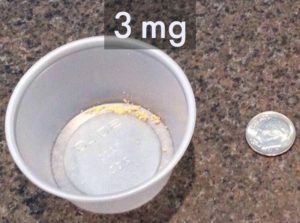 As you can see, 95% could tolerate 3 mg of a peanut, or about 1% of a peanut. 36 patients (92%) experienced some symptoms during the initial escalation day. Most common were upper respiratory symptoms, with 27 patients (69%) reporting mild sneezing/itching and mild laryngeal symptoms. No patients experienced severe upper respiratory or laryngeal symptoms. 17 patients (44%) reported mild to moderate nausea or abdominal pain, and 8 (21%) of patients suffered mild diarrhea/emesis. 24 subjects (62%) had mild or moderate skin symptoms. A total of 6 patients experienced chest symptoms during the initial escalation day; all 6 had mild wheezing, and 2 progressed to moderate wheezing. 3 of the subjects with chest symptoms during the initial day escalation also had a prior diagnosis of asthma. Subjects had symptoms after 46% of build-up doses. Subjects were on maintenance dosing at home prior to oral food challenge for a median of 4.7 months (range, 4–22). All subjects experienced rare, and typically minor, symptoms during some point of home dosing (3.7% of 14,773 doses given). Upper respiratory (1.2%) and skin (1.1%) were the most common. Treatment was given with 0.8% of home doses. Only 2 subjects received epinephrine after home dosing, and each of the two had only one such incident. People often ask how we “know” the starting doses will be tolerated. The answer is that they have tested this many times. Here’s a study published in 2009 where you can see how the “Day 1” suggested take-home dose of 3 mg was derived. In this clinical and mechanistic study, peanut OIT induced clinical desensitization in the 29 peanut-allergic subjects who completed the study. Ninety-three percent successfully completed an OFC to 3.9 g peanut protein, and all subjects had a significant increase in the amount of peanut they tolerated during food challenge. Peanut OIT was also safe; mild symptoms were relieved with diphenhydramine or albuterol. Our results are consistent with prior studies in which OIT led to clinical desensitization to foods such as egg and cow’s milk.14–16,22 Furthermore, the humoral and cellular responses associated with peanut OIT suggest that OIT also induces the transition from short-term desensitization to long-term tolerance. •Peanut oral immunotherapy (OIT) resulted in clinical desensitization for the vast majority (27/29) of peanut-allergic children who completed more than 8 months of therapy. •Evaluation of immunologic changes throughout peanut OIT suggests that desensitization develops by 6 months and is followed by the downregulation of the Th2 response to peanut. By 6 months, diminished reaction to skin prick tests and activation of basophils occurred. Over 6–12 months, secretion of IL-10, IL-5, IFN-γ, and TNF-α from PBMCs increased. Peanut-specific FoxP3 T cells increased until 12 months and then decreased thereafter. By 12–18 months, peanut-specific IgE decreased, while IgG4 increased. •During peanut OIT, T cell microarrays showed downregulation of genes in apoptotic pathways. This finding is novel and may provide insight into the mechanism of oral immunotherapy.